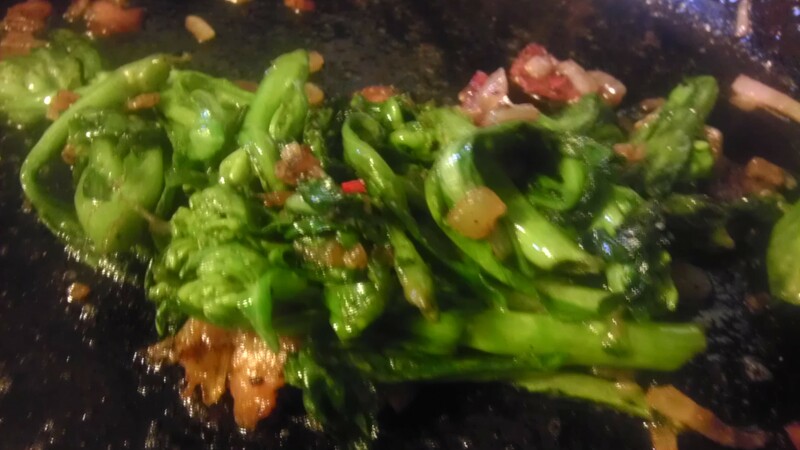 There’s nothing really special about sauteed greens. It’s a fact, It’s a platitude of earthy, seasonal, farm to table cooking. It’s a revelation to anyone who eats canned or frozen greens of any sort. It just is. Warning: Forgive the wonky cell cam shots, they were taken during a veritable vegetable fit of ecstasy. And then you go out to your garden and last year’s Green Glaze Collards, the oldest available American heirloom variety of collard green are starting to head and flower because all of a sudden the temperature caused them to pop. Kind of like Brussel and cabbage sprouts, they form these semi-tight little heads with a quick crown of florets. I topped mine the same way a tobacco farmer wants leaves but not flowers and seed pods, and brought about, I don’t know—a half a pound of fresh new greens, untouched by insect or drought, into my kitchen. I looked at them, put them in some water to keep them alive, and then grabbed a shallot, an onion, some beef bacon and went to work with a cast iron pan. This is a downright glorious present from the Universe to the gardener. I’m getting into using vegetables in multiple ways, which is a deep part of the African and African American and Afro-Caribbean gardening tradition. Leaves, roots, stalks, seeds, flowers are all game. Judging from my collection of historic Southern cookbooks, these kinds of sprouts–ever so valuable because they were the first real fresh green you enjoyed once the garden came back to life–used to be much more common on the table. We have lost a lot of knowledge of eating sweet potato, okra and cowpea greens; collard sprouts and roots, and using okra seed in our diets. What’s the most exciting part is that you can harvest several crops of foods from the same plant sustainably and keep it going through to full harvest. It’s an ingenious way to use all of your resources at hand, developed by a global people who have often had to make do in order to survive. This recipe has a lot of adjustments depending on your cooking style, so be aware–you can make it vegetarian, vegan, kosher, halal, or straight up pig in a pan. I give you all the possible options here. But grieve for the angels, cause they ain’t got em! Put your choice of fat in the pan. Cook and render your meat fat or just put the olive oil and butter and margarine in the pan. Note: If using meat, render the grease first, then when the vegetables go in, add the margarine or butter. Add the shallots and onion to the pan, gently saute. 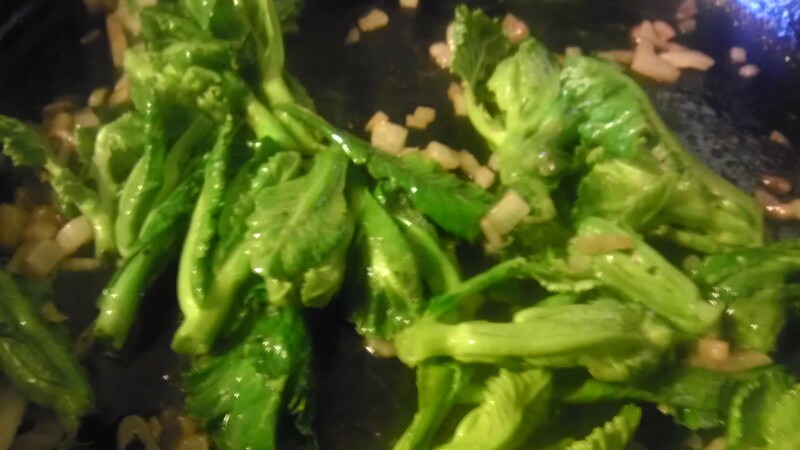 Keep the heat medium-low, cook the shallot and onion halfway and then add the collard sprouts. Add the chopped bacon to the pan and toss around, Cook until glazey, gold on the edges and a little wilted or about 10 minutes total. Add salt and red or black pepper to taste. Oh you are making this look so good and so easy – Thanks! I got some collard sprouts in my veggie co-op box. 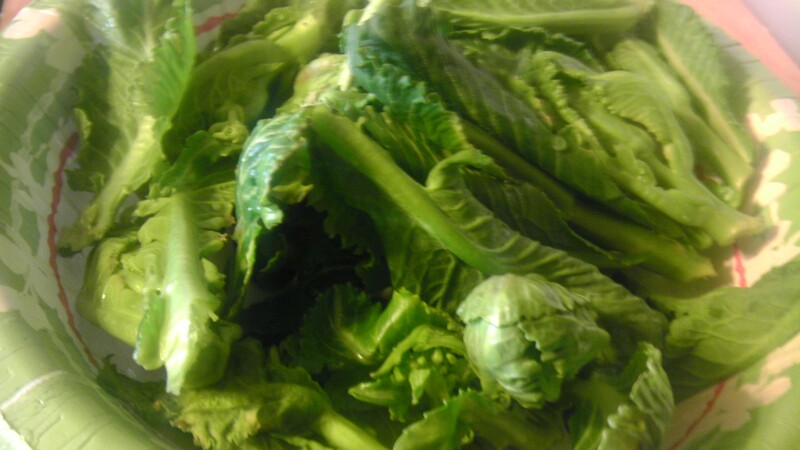 I wasn’t sure about cooking fresh greens but your “fat element” broke it down perfectly for this novice! Thanks!